1. Water usage charges are phuck all. most of the charge is fixed. 2. I'm paying for power to pump the water out of the tank. Is it cheaper to pay for the water and not the pump? What are the environmental effects of paying for the water, but not the power? on the balance am I actually doing more damage to the planet by getting free water and paying for power vs paying for water and not polluting? Why does the pump need to be powered? Can it be gravity fed or manually pumped? it was just a general observation that perhaps tanks are uneconomical and not environmentally friendly. I can picture zaph in centurion get up wielding a whip over the peons as they carry water to his pool. and none of that using buckets crap. tea cups for my slaves! I grew up as a child in house that was entirely run on gravity fed tank water. NQ - 1960's. Our shower was under the tankstand - 2 storey queenslander. No pump, but a windmill on the well, topped the tank up, if it didn't rain. Had to make sure all taps were working properly and were always turned off. We had a 5000 ltr tank setup on four stilts. Even at the height of summer, that water in the tank was always freezing cold. Our hot water system went through the wood stove, so you had to make sure the fire was going before you had a shower. I honestly believe that it is both energy efficient and entirely sustainable system. The thing is that most people today have got used to pressurised systems. They like to fill the washing machine up in just a few minutes rather than 20 - 30! Many other differences as well. We watered the vegie garden with buckets, until dad constructed a sprinkler system for mum. She thought it was just the greatest. Did I mention though, there was no flush toilet back then. My great grand mother lived in a unit in 1980s East Germany where the toilet was on the half-floor between the residential floors. You used a bucket to flush if the neighbour had remember to refill the bucket after use. There was also an outhouse in the communal garden. It was a great time to be alive. One of my favourite anecdotes is that my in-laws got broadband before they got running water! They only had a toilet installed about a year ago. The unfortunate thing is due to artesian water the pipes could only be placed about a metre underground, and the pipes froze during the winter making the toilet unusable. That meant it was back to the long drop in -40 weather (or a bucket inside). BTW nice photo, thanks for sharing. Should have mentioned that the photo is only an example. Hope it has no royalties on it. I actually don't have a photo of our old place. Our family didn't own a camera until I was 12. How does the water get from the roof up in the tank? We have a bore and retic which runs off a pump. 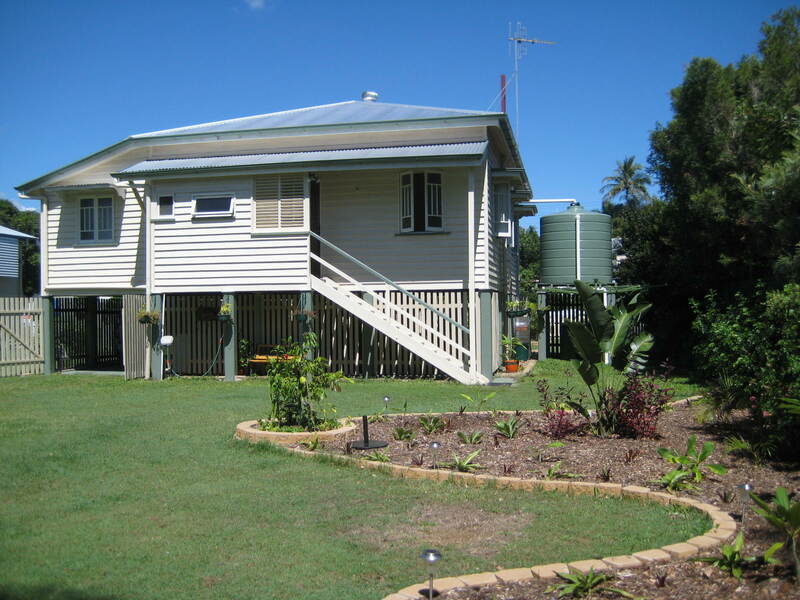 We lived in a two storey queenslander. All one side of the roof ran to the tank. That first photo was not the best illustration. This is closer to what I lived in as a kid. Our tank was larger in circumference, and less deep. This allowed it to be higher in relation to the second floor, and gave the whole tank contents to gravity feed into the kitchen. I hope that makes my description a little clearer. I think Mosquitos were another reason they got banned. Pretty ridiculous how things go in and out of favor. So wastefull. On the question of efficiency everyone here does run bore plus retic for gardens and I expect if it cost more than town water they wouldn't. So water is more expensive than pumping I expect.